Installerstore.com appreciates your interest in our philanthropic goals. We are proud to support organizations that work to strengthen our communities. As dog and animal lovers, we proudly support local shelters and rescues with the common goal of bringing people and animals together to enrich each others lives. Madison Area Habitat for Humanity ReStore - Donated new and used building materials to the public at discount prices. All proceeds from the Habitat ReStore help build or remodel Habitat Homes in Dane County. The Parrot Preserve, Inc. exists for the purpose of education the public about exotic birds (both domestic and in the wild), and to give a permanent home to abused, mistreated, and unwanted exotic birds. 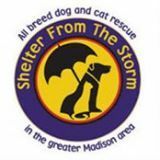 Shelter From the Storm is an all breed cat and dog rescue that focuses on alleviating overcrowding in shelters and helping adoptable/treatable animals. Funding is also provided to Spay Me! Clinic that extends a helping hand to other rescues and shelters by offering spay/neuter services at a lower cost. Goodwill Industries of South Central Wisconsin, Inc - Their mission is to build better communities by providing opportunities for people with disabilities or other challenges. St. Bonaventure Indian Mission and School - Serves the Navajo living on the Eastern Navajo Nation. In addition to operating a tuition-free school, St. Bonaventure Mission provides extensive human services for those living in poverty. Alzheimer's Association Annual Walk - Rugrats Flooring participated in this years annual "Walk to End Alzheimer's" as a team, and raised over $900 for the great cause. This put our company team in the top 10 corporate sponsors for this event! Henry Vilas Zoo - Henry Vilas Zoo is a 28-acre public zoo in Madison, Wisconsin, United States that is accredited by the Association of Zoos and Aquariums. In what has proved to be a defining and truly visionary move, the park has always been admission free. Today it's an extraordinary asset that few communities our size can claim. ALS Association- In August of 2014, Installerstore.com participated in their own Ice Bucket Challenge, and contributed $1 to the ALS Association with every like/share of the video on their Facebook Page. Through Labor Day Weekend, 234 likes/shares were accumulated, resulting in a $234 donation! Check back often for new community contributions!